You must obviously be trying to see how often I can sort this out for you. I can tell you that at the beginning of this thread you said "the majority of CGS monumentations are not in the Database we use" If this is so, then "Houston? We Have a Problem!" Now you say the Geodetic Survey didn't exist in 1950... But I am afraid it did. That is just plain not true. The CGS, or CG&S or USCG&S is the Coast and Geodetic Survey. The very same, continually operating government agency it has been for 198 years now, but with a name change in the 1970's when they became a department governed under NOAA... Today it is known as the NGS or the National Geodetic Survey. They never missed a beat and have only ever had their database. Still the agency for geodetic control for nearly 200 years, and the longest operating scientific agency in the US Government. So how would you justify that most of their marks are not in the database we use, when their very database is the database we use? Perhaps the majority of what you may remember about the NGS needs a brush up eh? Perhaps your memory will be refreshed by some of these? Please BlackDog, I feel you see yourself as an authority on this subject and are quick to answer questions for people here, and I respect your desire to help, but in your zeal, you seem to miss some important details. A good bit of what you have told the Leighhale is way super questionable. From the beginning of this thread on up to today, I find what you seem to know about this topic as not terribly accurate or well understood. Thinking back over many conversations over the past year, you have attempted to take me to task many times, over facts that are historically documented and easily researched. Why you seem to enjoy arguing with people who work in the survey field over things they know professionally is a very interesting question. You are even known not to accept the answers that the Chief Geodetic Surveyor of the NGS gives you, but things are what they are never the less, even if you aren't convinced. The Facts again speak for themselves. Please, no haughty smirks are necessary, just simply put your pride aside and do your homework. It's not about any of us, It should be about trying to be as correct as we can. Oh and for clarity, the 2 ways the game is played DOES cause confusion as this thread continues to point out and that is why I raised the comments I made. Though some of you feel violently at odds with me for my opinion, in fact some of you have been a lot less than kind or constructive in your arguments with me, yet I continue to espouse the same sentiment and I am further justified in doing so by the continued confusion. I would like to see Geocaching follow NGS as it would be of no harm at all and a lot less confusing. Well the question is, do any disks monumented in 1950 have the logo of the NGS? leighhale - What you found was an "NGS - Vertical Control Marker" not a "CGS" type of benchmark. The NGS style wasn't used in the 1950's when the mark you were looking for was set. The description for the mark you were hunting reads "SET VERTICALLY IN THE NORTH FACE OF THE 1ST PIER WEST OF THE EAST END OF THE UNDERPASS.". The mark in the picture is set horizontally not vertically. I think I would try measuring from the EAST rail and look at the side of the "Pier". The mark is set about 4.5 feet above the ground JUST west of the east end of the concrete wall. It may be at ground level or lower depending on whether or not there is much build up of soil and/or debris. Good luck on finding this mark. If you do go back and look some more, let us know how you do. I did look over there as well, hence the DNF. I did NOT try to dig under the rocks though! so it could be that the rocks have creeped up over the mark by now... I may give it another shot. Leighhale - The mark at the underpass has "Scaled" coordinates, so you can not go by them for accuracy. It is necessary to follow the written description as closely as possible. As you suggested, maybe during maintenance on the underpass the rocks were gradually piled higher and higher until the mark was covered. Try going for "Adjusted marks" for a while to help get the feel for benchmarking. I just noticed another problem with this one... The mark I found was 922 feet elevation and the mark I am looking for is 945.25 feet elevation ADJUSTED. This would mean that the true mark is 23 feet higher up, but the mark found was 4 feet off the ground as it is. Yes, looking for them can be habit forming! The psychology of looking for them is rather different from looking for geocaches. When you go looking for a geocache, you know that the probability of it being there is very high. When you go looking for a benchmark, you realize that there's a significant probablity that the mark you're searching for isn't there. That makes it all the more exciting to find them! I agree with 2oldfarts (the rockhounders)'s advice and add that the marks monumented more recently will be easier to find too. Ones as old as 1950 tend to be tough unless they are at the top of a mountain or something. You're lucky it was only off 23 feet! Most of the time a GPSr will be off quite a bit on the elevation. I have stood next to an elevation sign and have the GPSr be off over 100 feet on elevation. When you find an elevation mark set your GPSr right on top of it for about 15 minutes and let it get a good reading and then compare the elevation reading with the datasheet, very seldom will mine read with in 25 feet of the posted elevation. I normally disregard elevation reading when hunting for a benchmark. I read leighhale's original post and they did not ask that question, nor did they imply the year 1950, you did. You didn't ask a question, you made an erroneous statement. Your claim simply isn't supported in or out of context. The punctuation and sentence structure you used made your intention clear. 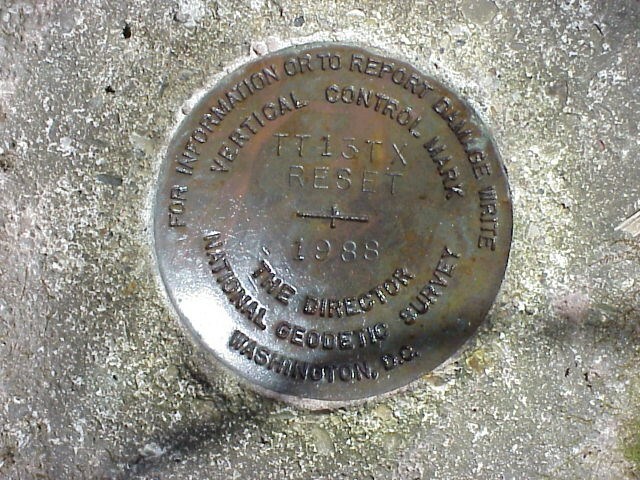 The Geodetic Survey existed in 1950. 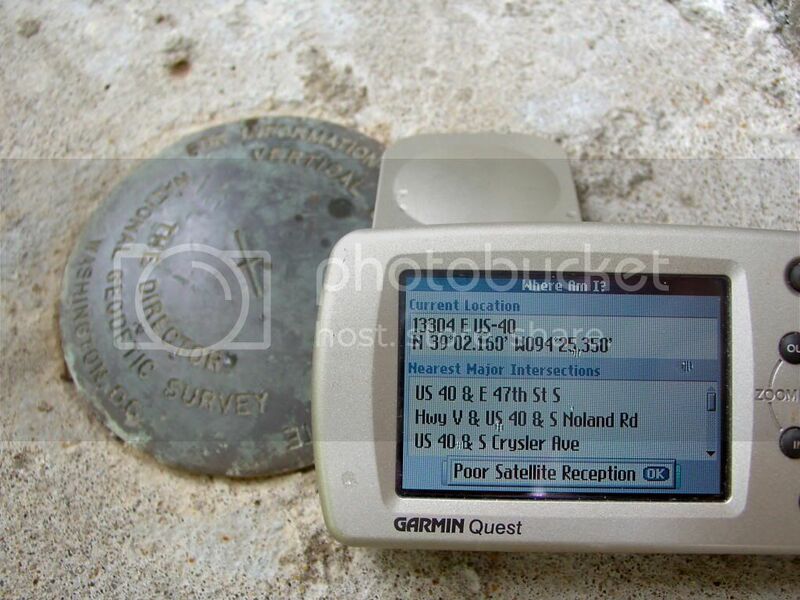 It is the same geodetic survey that began in 1807 and exists today. As I said, they had a name change but that is the lion's share of the difference as far as these survey markers are concerned. As you would expenct, the Discs themselves reflect the name change... If you were referring to the era from which a particular disc design was in use, you could have been more clear in your communication. In either case, your statement was erroneous, just as the one at the beginning of the thread where you claimed that Most CGS discs are not in the database we use. Perhaps the NGS Database is the cumulative effort of the 200 years this agency has been keeping data, perhaps the database is comprised of the best data they have, and other data which is in there, while shielded from public for various reasons is still a part of that very database. There is no crime in not knowing, No crime in saying you don't know. No crime in only answering what you think you know and leaving what you don't know unanswered. We all have things we can learn everyday. But I don't see any reason to answer in ways that change what is true, or that attempt to teach things that simply are not so. There is also implications in assuming people know what at background you are referring to is all about when you allude to is but don't support it and they are new to this and trying to learn. People read these forums to learn from us and I believe we owe them the best answers we can give. There is no added value, nor anything to be gained in people reading this forum and coming away with false understandings. Shortcuts can be throat cuts... Many people enjoy the background info. It helps them understand the how and why of all this. It is easiest to credit your answers to facts that can support what you say. If you can't, then either say so, or make note that you are postulating or sharing opinion. Opinions don't have to be facts, they just have to be noted as being opinions. NGS is not keeping any secrets, and a lot of the information is available on their website. All that is needed is to take the time and read. BDT - I wish you would get your facts straight, just because the question referenced a disk monumented in 1950 doesn't matter. We all know the name change to the "NATIONAL GEODETIC SURVEY" happened quite a few years after that disk ( that was linked to) was monument! That being the case NO disk from 1950 would have that stamped on it. Obviously Someone didn't read the question and answers very carefully, now did they? To be certain John, I can clear this up for you, BlackDog and anyone else who feels the need to chime in with confusion. This is not something that would qualify you as having a Dog in the fight. Further, the people who know the difference have the advantage over those who do not. Since you seem to feel the need to add your .02, allow me to set this all out in the clear for everyone. Leighhale, having just five posts in the forums here at Geocaching is not someone I would assume as being someone who knows what you know, or what BlackDog thinks he knows, as based on his recent show of attempting to get it right. I believe we can (and should) do better research for those who ask, as the asker deserves correct answers, or at least a warning that certain aspects of the answer may not be correct. If we cannot rise to that level, then perhaps we should refrain form any comment. Saying "we all know" assumes a lot and isn't supportive at all of those who do not. Many many people read this forum without asking you for permission John, so it is safe to say that there is a lot that you and BalckDog cannot control. The askers of most questions are pure and honest, and they deserve good answers. BlackDog made statements which were incomplete thoughts at best and incorrect at worst. BlackDog would have been correct if he had said that the Geodetic Survey had a different name in 1950, but he was blatantly incorrect in saying that it did not exist. Leighhale in no way whatsoever asked any question regarding the 1950 history of this location. BlackDog didn't Ask either, but he used the history of KE0135 to support his theory. I did not attack his theory, I questioned the accuracy of his statement because in or out of context the statement "The Geodetic Survey didn't exist in 1950." is not now nor never was true. As to reading carefully John, sorry, but I am afraid that backfires on you. There is nowhere in the first paragraph from BD to leighhale where the Acronym NGS nor the Name National Geodetic Survey was mentioned to support BD's thinking. In fact, BD never said either NGS or National Geodetic Survey in his entire answer, so without him having done so John, you cannot make your point. Go ahead, Overcook the Spaghetti John, it still won't stick to the wall. You can't take something out of context that has not been put in. By resorting to snickering and snide comments, along with the host of emoticons you feel the need to use in order to convey your bottomless desire to act like a Troll only drives the point home over how much of a childish person you are. I hope you can get a handle on your insecurities soon, because a lot of us here seem less clear all the time about what your motivations seem to be. Both you and BlackDog ought to reconsider your motivations for acting out in this way. It is pretty disrespectful and disruptive to the rest of us. My Motivation has never been to flame you, but rather point out your inappropriate actions, which I disagree with and to ask you to stop. The major difference between most of the rest of the fine people here and I is that I have been the focus of your disrespectful actions, and I have no qualms about calling you on it. Of course I could allow you to bully me and allow you and BlackDog to try to rule how I act, But I am afraid you have chosen a wrong person to bully. If that is your motivation, you have found nothing less than a rival and potential adversary. I would caution you to not follow such a path. I would not blame the other fine people of this forum for not wanting to become involved, or associating with the likes of your troll like actions. In other words, John, BlackDog, Neither of you have any place to act smug here. I have no plans on offering you a free pass to continue acting as you have, So think it over. You can fight or switch, But I can wait you out till you just switch. Mocking me is making you look a lot worse than you hope it will affect me. I haven't acted inappropriately towards anyone, not even you. Forums are most certainly a great place to have a Healthy depate. It is a place where we can learn, evolve and discuss. Please learn to disagree in a more respectful, productive way, or keep your comments to your self. This is not an elementary school playground. Try to be proactive and remember the advice everyone's Grandmothers gave, "If you have nothing nice to say, then keep your comments to yourself". The ball is and will remain in your court, so fly right. Calm down Rob, When BDT says the "Geodetic Survey" didn't exist in 1950 he is technically correct. The agency was the CGS and yes it is the same agency but with a different name. The NGS had not been named at that time. The 1950 referenced is the monument date of the benchmark leighhale was looking for. Check PID# KE0135. The NGS reference came about because leighhale posted a picture of a mark that he found near the location KE0135 was supposed to be located. By telling leighhale that the "Geodetic Survey" did not exist was just as correct as telling him that the disk was not the one he was looking for and why he knew that to be the case. Have a beer and relax. Go ahead, Overcook the Spaghetti John, it still won't stick to the wall. This certainly clarifies things for me. Think I'll adjourn for an adult beverage and some benchmark logging. I am Calm and relaxed John, I even enjoy beer. I just think we can do better than this entire thread has shown, and I feel both you and BlackDog could go a long way towards better futures by choosing a different behavior in your dealings with me. CGS USCGS and USCG&S are all Acronyms for United States Coast and Geodetic Survey. To say the Geodetic Survey didn't exist in 1950 is incorrect. It did, and the words Geodetic Survey were in the name of the agency then as they are now. I left links to the history of the agency that completely support the history and the point I am making. In other words, I can back my claims with facts and I am. Leighhale did not ask anything of the history or the look of the discs in any era like that in the initial question, and it might be safe to assume that they could be completely unaware of any difference at this stage of the game. No Matter, BD poorly covered it in his reply. He basically answered something which wasn't asked and he went about the answer incorrectly. If he would have said "National" along with "Geodetic Survey did not exist in 1950", he would have only been somewhat more correct, but not as correct as he could have been. The truth is, the Geodetic Survey has always existed. It has never not existed in the last 198 years. The Name change came with the NOAA change over in the 70's and so did the look of the Brass discs. Perhaps you have not read the history on the "Geodetic Survey", But I highly recommend it to anyone, as it answers a lot of questions, enmasse. BD's reply was a string of incomplete thoughts at best and to a newcomer, it tells them a lot less that it tells an established member in this forum who has studied the subject awhile. I can surmise without looking at the datasheet that even leighhale sees something odd here, and that is correct. The Photo submitted from the location certainly is indicative of a station monumented well after the 1950's era. Getting back to BlackDog's reply, It was not a correct statement John, and your support of his statement isn't correct either. Sorry John, Check your facts. It answered nothing at best and at worst it answered it completely wrong. It could have been done better a number of different ways. Beyond that John, This is not your Dog. 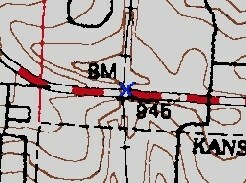 Very often, these older marks can be found on the USGS Topo. The mark in question, KE0135 ,is probably the one marked on the USGS Topo at Elevation 946, which is in line with the published elevation. Here is an enhanced look at the spot. I made the X blue so it is easier to see. The cooords are N 39 02.160, W 94 25.346. You can get the image by clicking on the Topozone link on the Geocaching page for the mark. Once you get to Topozone, set the Coordinate Format to UTM, then click your mouse right in the center of the Black X by the BM. This will give you coords that are usually within 10 - 15 feet of the mark. USAPHOTOMAPS also works well for this. In my area, I can use this to get coords for marks placed before 1965 or so. As you can see, this mark is directly under the Highway. 12 1/2 feet puts you awfully close to the tracks. Be careful about Trespassing on RR Right of Way! I think what you may have found is a different mark. The reason I think that is that you found a mark with the National Geodetic Survey logo on it and the KE0135 was monumented by the Coast and Geodetic Survey (CGS). You find this out when you click on the place in the datasheet that says "view original datasheet" and look at the place that says "KE0135 HISTORY - 1950 MONUMENTED CGS". The National Geodetic Survey didn't exist in 1950. I imagine you followed what I was trying to say anyway. KE0135.an estimated accuracy of +/- 6 seconds. Using Topozone or the equivalent gives you a much better chance at finding the true coords. The coords they published are about 200 feet from the X on the map in this case. 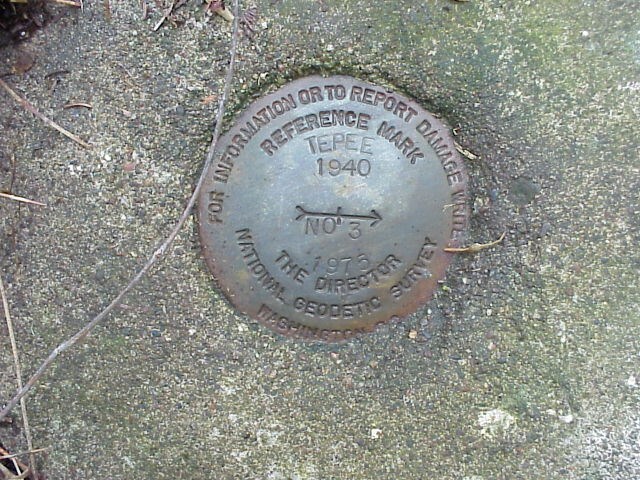 leighdale -The National Geodetic Survey didn't exist in 1950. What BlackDog seems to have trouble saying here is that the National Geodetic Survey was known as the Coast and Geodetic Survey back in the 1950's. They are the same agency handling geodesy, and CONTINUOUSLY in existence since 1807. Same Database, Same Survey Markers, Same People... They are preparing their Bicentennial celebration for 2007. There is a major level run thru the UP (US-2, St Ignace to Green Bay) of Michigan leveled in 1972 by NOS and all the survey disks are of the US Coast and Geodetic Survey. I recall resetting some BM's around 1985 and the disks they sent us were National Geodetic Survey. Here is one we did in 1988 but I know there were some earlier. (Did I do a good job of stamping that or what? Interesting. I guess the NGS just used their U.S. Coast and Geodetic Survey disks until they ran out of them. I wonder when the last USC&GS disk was set. I did see a recovery note from the CGS on a station around here from 1991. When we met with some NGS guys a few months ago, I was going to ask them about that, but forgot to. I knew I had seen an earlier disk. I would agree, they continued to use up the USC&GS disks. Leveling uses more disks so it safe to say they probably had a lot of those. I bet a lot got made into belt buckles, one NGS guy we helped out back in the 1980's was wearing a survey disk belt buckle. A Brief History of NGS/NOS -- The origin of the National Geodetic Survey (NGS) goes to the Organic Act of February 10, 1807 signed by President Jefferson creating the Survey of the Coast. The organization changed its’ name in 1836 to the Coast Survey and again in 1878 to the U.S. Coast & Geodetic Survey (USC&GS). The reorganization of science agencies in 1970 led to the creation of the National Oceanic and Atmospheric Administration (NOAA), under which the Office of the National Ocean Survey (NOS) had several functions. Surveying activities, and hence mark setting was divided between 4 distinct efforts; geodesy, shoreline mapping, airport surveys and tides and water levels. Geodesy was organized in the National Geodetic Survey (NGS) using NGS disks shortly thereafter. I was hired by NGS on August 14, 1972 and from my first day on field parties we were using NGS disks although most of the field units still had small stores of C&GS disks. Shoreline mapping and airport surveys were assigned to the Nautical Charting Office and used NOS disks while tides and waterleaves was assigned to the Tides and Water levels Division also using NOS disks. During 1993 the field teams that performed the shoreline mapping and airport surveys were transferred to NGS and started to use NGS disks. The tides and water levels surveys is now part of the NOS, Center for Operational Oceanographic Products and Services (CO-OPS) and they still use NOS disks. I started for the MIDT on April 15, 1972 in Grand Rapids, I am retired and you are still working. You must love your job. Working for MIDT was OK till around 2000 when they decided surveyors were getting to bosey and cut our ranks from about 50+ down to a handfull and put us under local region control. Went from a 4 man crew in 1997 to only me in 2002, when my boss (PS) and I could not take it anymore and took early retirement (incentive going on to retire). I just recall we reset a BM survey disk back in 1976 (bicentennial year) and NGS (mark maint. guy?) sent us a disk to set, already stamped, instead of RESET 1976 it was stamped RESET 1776. Our guys who set the monument never said a word. When we were out doing the leveling and description, we noticed the 1776 date.